Peace. It’s an unusual word in this bizzare time. Some say it means that war is not present, but this word has more depth than just that meager definition. It's true that without war we can gain peace, but war is inevitable unless we take steps to prevent it. Peace is mutual love for the people around us. 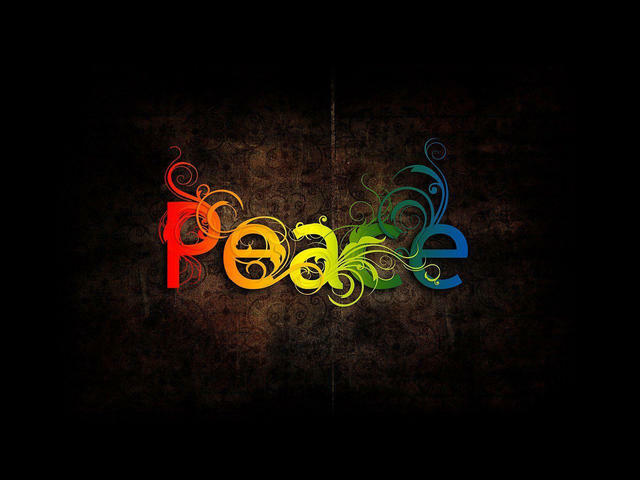 Peace is the freedom from fear of not only violence, but judgment. We have so many problems nowadays other than war: climate change, poverty, and human trafficking, just to name a few. With all this chaos, peace is the element the world is craving. When my mother tells me "I love you" before I go to bed or when my father praises me for good behavior, I receive not only peace, but love. We as individuals have to take action now to promote a peaceful and loving world by accepting ourselves, accepting others, and building a loving relationship with our planet. An important step for finding peace in the entire world is finding peace within ourselves. Many believe finding peace within themselves requires tiring hours of charity and volunteering. Some say inner peace is achieved through self-acceptance, and some say it’s achieved by knowing who you truly are. But my mother, my most reliable and beloved source, tells me, "You will only find peace if you do the right thing. It may cause some problems for you, but your body will fill with the most tranquility and your chest will puff with pride. And even though it may not seem like it, you did the right thing." If we all live our lives with integrity, we will stay true to our ideals, beliefs, and who we truly are. It will be easier to communicate with others and therefore create peace. We must try our hardest to spread this value, and soon it will be the stronghold of our peaceful world. Our second step should be valuing all religions in order to promote our love for all human beings. Many religious ceremonies promote peace and many religious scriptures focus on this idea as well. When my mother reads the Bhagavad Gita, a Hindu scripture about doing good toward others, do I not feel peace and appreciation for my friends, my family, and the world? Similarly, we should be informed about other religions and cultures to receive this appreciation. We could start small, spreading awareness of different cultures to our friends and family members. If you think a particular group is immoral, then sit down and talk with them. If you don’t like a person’s particular view, then ask the person to educate you. Krishna, the wise guide in many Hindu religious scriptures as well as a revered Hindu deity, offers the following advice: "Whoever has purified his mind in the fires of Knowledge and mastered his senses will obtain this Peace." Next, we must heal our relationship with our planet. According to the Hindu tradition, it may be in the world’s nature to perish. However, we’re producing this catastrophe more and more each day by harmful pollution. We can form cleanup crews and hold environmental rallies. Slowly, our world will begin to restore all the damage we have inflicted upon it. In some countries, like China, people have begun planting trees on buildings to decrease air pollution. We can implement this in majorly polluting countries like the United States, India, Russia, and Japan. How does this promote world peace? Slowly we connect with each other during these rallies and meetings. We all become linked through one common endeavor, and we can help each other grow in our personal development and success. What better way can we connect with different people, while bettering something that is in all of our interests? Not only do we create friends, but we bond over the healing of our planet. As this approach becomes more and more popular, more and more people will want to participate. Just recently I did a cleanup event around my school, which not only attracted the public but got students excited to help out. Kids and adults, we are now all represented as one to heal our planet. Sure, world peace may seem like a wild ideal. But there are ways we can get closer to receiving peace within ourselves and for others. From now on, we have to take the steps to attain a peaceful world. We should learn to love ourselves, each other, and our planet. I decided to write all my emotions, ideas, and beliefs into a poem that best captures my vision. The poem describes how I, and many others, feel we can attain peace for ourselves and others through more than just simple words. Daman, Sunil. "100 Great Bhagavad Gita Quotes from Krishna." Patheos, October 14, 2014. www.patheos.com/blogs/hindu2/2014/10/100-great-bhagavad-gita-quotes-from-krishna/. Debating Europe. "Is the Idea of World Peace an Impossible Dream?" June 10, 2014. www.debatingeurope.eu/2014/10/06/world-peace/#.WyckFq2ZPBI. Deschene, Lori. "40 Ways to Create Peace of Mind." Tiny Buddha, 2012. tinybuddha.com/blog/40-ways-to-create-peace-of-mind/. Horgan, John. "How the U.S. Can Help Humanity Achieve World Peace (Yes, World Peace)." Scientific American, January 17, 2012. blogs.scientificamerican.com/cross-check/how-the-u-s-can-help-humanity-achieve-world-peace-yes-world-peace/. Krishna.org. "The Peace Formula." December 8, 2016. krishna.org/the-peace-formula/. New Hampshire Department of Environmental Sciences. "What Can I Do to Help Reduce Air Pollution?" Air Quality Monitoring and Data Program. www.des.nh.gov/organization/divisions/air/tsb/ams/aqmdp/share.htm. Peace Pledge Union. "War and Peace." Learn Peace. www.ppu.org.uk/learn/infodocs/st_war_peace.html. Smith, David Livingstone. "Getting Rid of 'Racism.'" Philosophy Talk, October 3, 2017. www.philosophytalk.org/blog/getting-rid-racism. Vidal, John. "How Are Cities around the World Tackling Air Pollution?" The Guardian, May 17, 2016. www.theguardian.com/environment/2016/may/17/how-are-cities-around-the-world-tackling-air-pollution.